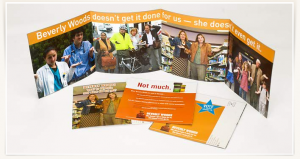 Beverly Woods was the subject in these critical 2006 campaign ads created by Moxie Media. The picture comes from the company's Web site. In 2006 voters in the 23rd Legislative District received mailers asking the question, “Beverly Woods went to Olympia and what did we get?” Woods, a Republican, was first elected to the seat in 2000, beat Democrat Sherry Appleton by 4 percentage points in 2002 and in 2004 she won handily over a candidate who did not campaign with much intensity. In 2006, though, she faced off against Democrat Christine Rolfes, a former Bainbridge Island city councilwoman. Rolfes ended up winning by 9 percentage points. A blog post just weeks after the election at the conservative site Sound Politics had in its comment string a conversation blaming Woods’ loss on her vote for a gas tax. Many people have said to me the same thing, that Woods lost her base when she voted for that tax. However she lost, the mailer is the issue here, because it was created by a firm that finds itself in hot water with the Washington State Attorney General, Rob McKenna. Moxie Media is being sued by McKenna for the company’s under-the-radar efforts to oust a conservative Democrat in the 38th District in 2010. It’s the under-the-radar part that could get them in trouble, because the company allegedly created political action committees to temporarily hide the liberal money (labor, trial lawyers, etc.) that was pitching a conservative Republican who was not running a strong race. The effort helped put the incumbent, state Sen. Jean Berkey, in third place, virtually guaranteeing victory in November for Democrat Nick Harper, who as of Tuesday had received nearly 60 percent of the vote. The Washington State Wire has an explanation of what went on with Moxie and Berkey, explaining the money gets hidden. Moxie Media’s anti-Bev Woods piece is one of several the company highlights in a portfolio on its Web site. The work Moxie did for Rolfes was pretty straightforward. Sure, some of it in 2006 was negative advertising, but there do not appear to be any obvious efforts to hide who was behind the ads. A search of Public Disclosure Records show that over three campaigns Rolfes has spent $61,625 for Moxie Media’s help. Rolfes said the recent news does have her considering who she will employ in the future. “I had never seen them do anything that wasn’t above board. I’m disappointed to see how that company worked in another race,” she said. Moxie’s work has showed up in other local races. In 2006 the company promoted Kyle Taylor Lucas, who tried to best state Sen. Tim Sheldon for the Democratic nomination for senator in the 35th District. The company was paid more than $50,000 from three different PACs, all of which had “Have Had Enough” in the name. In 2006 the Harry Truman Fund, which supports Democrats, spent about $17,000 for ads against Republican Ron Boehme, who ran against Larry Seaquist in the 26th District. It is true that Moxie shows more than $200,000 in receipts for Kilmer’s campaign between 2004 and 2006. There were none, however, in 2010. Kilmer said he worked with John Wyble, who co-founded Moxie, but left in 2008 and formed his own firm, WinPower Strategies. Kilmer took issue of England’s use of the word “works.” “Once again Trent England hasn’t done his homework,” Kilmer said, adding that the ads he pays for do not mention his opponents. “The way I approach campaigns is like a job interview. “I’ve never gone into a job interview and said ‘This is why you shouldn’t hire the other guy,'” he said. Democrats generally have condemned what is alleged to have been done in the 38th. Berkey, for her part, is asking that the Legislature not seat Harper, saying the election was tainted, according to a (Everett) Herald story. Rolfes, who did work with Lisa MacLean, the Moxie founder named in the Attorney General’s suit, said she hopes the discovery of what happened with Moxie is evidence that the system worked. “The whole point of the Public Disclosure Commission is to allow a forum for catching these kind of indiscretions and unethical and possibly illegal acts,” she said.